Summer is kind of a low season for TV - especially this year with Graceland cancelled (one of my favorites) - but there is one summer show that we love. 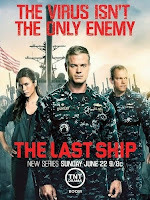 The Last Ship just came back for its third season, and it just gets better and better, with an intriguing & unique story, high drama, and a great cast. 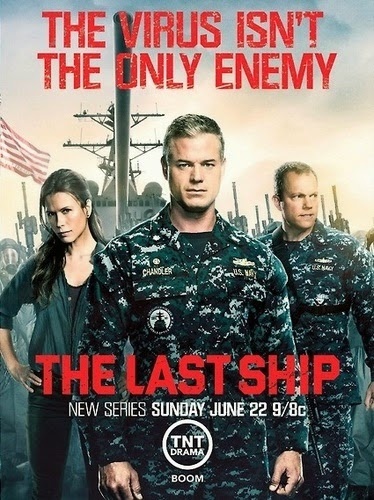 The Last Ship begins with a viral pandemic outbreak. The show follows the crew of a Naval Destroyer called the Nathan James, which was on a top-secret research mission in the Arctic when the pandemic hit. In fact, their mission, unbeknownst to them, involved the virus that caused the pandemic. On board their ship is Rachel Scott, a world-famous virologist who needed to go to the Arctic to look for a primordial version of the virus in order to create an effective vaccine. By the time that mission is complete, the whole world has gotten sick, and chaos has broken out. Rachel finally tells the captain, Commander Tom Chandler, played wonderfully by Eric Dane (who could have guessed that McSteamy from Grey's Anatomy would make such a good military man? ), what's going on, both with their mission and with the rest of the world. By now, millions of people have died, including the U.S. President and Vice-President, and Rachel's goal to create a vaccine has become even more important. Having been completely isolated in the Arctic, the crew of the Nathan James is healthy and not at risk as long as they stay out at sea. So, now they are a floating crew of survivors, tasked with nothing less than saving the world. It's not as simple as Rachel just doing her work to create the vaccine, though, because chaos and anarchy are in full force all over the world. There are evil forces that want to capture Rachel and the vaccine for themselves and keep it from the rest of the world. Most of that happens in the first episode or two! From then on, it is a fight to survive...and to save the world. My husband and I both love this show. It is an intriguing plot, with lots of twists and turns and plenty of action and suspense. The cast is incredible, and you quickly grow to care about them. The second-in-command, XO Mike Slattery, is played by Adam Baldwin. Plus, there is a full crew of excellent actors. This is truly an ensemble show, though I haven't had any trouble keeping track of the characters. The overall quality of the show is excellent, from the very first episode through the current third season, in which the world has changed dramatically, but the Nathan James is still of central importance. We can't wait to see what happens next! Seasons 1 and 2 of The Last Ship are available on Hulu (with subscription), through Netflix DVD service (not but streaming), and on Amazon Prime for $1.99 an episode or $14.99 a season. Our Cable on Demand currently has the last 5 episodes of season 2 and all episodes so far (5) of season 3, as does the TNT website. It's Monday 7/25! What Are You Reading? It's Monday 7/18! What Are You Reading? It's Monday 7/11! What Are You Reading? It's Monday 7/4! What Are You Reading?